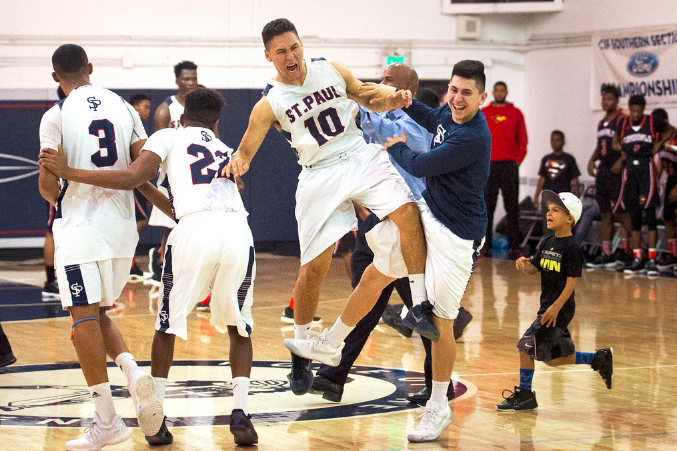 SANTA FE SPRINGS — St Paul High School’s long wait is over.The Swordsmen, after 16 seasons, are back in the CIF Southern Section boys basketball finals, and they have senior Louis Bangai to thank.The center scored a game-high 22 points, including making five free throws in the final 30 seconds, to lead St. Paul to a 56-52 victory over visiting San Bernardino in a Division 3A semifinal on Friday night.Nate Kasongo had 17 points and Kylan Mann 13 for the Swordsmen (24-5), who will face Twentynine Palms, a 65-64 winner over Hesperia, for the championship. The title game will be either March 3 or 4. The CIF-SS office will release the day, time and site early next week. St. Paul last made a final-round appearance in 2001 and won its only title in 1997. O’lajuwan Barnes scored 18 points and Matthew Bradley had 15 for San Bernardino (19-10). San Bernardino, which nearly rallied from an eight-point deficit to begin the fourth quarter, had a chance at the lead late but Isaiah Mitchell’s 3-pointer with 35 seconds was long. Mann grabbed the rebound before Bangai was fouled. The senior center made both attempts for a 53-50 advantage. The Cardinals gave the ball back to the Swordsmen on a back-court violation with 14 seconds left. Bangai was fouled again and made one of two free throws for a 54-50 lead. San Bernardino cut it to 54-52 with six seconds left on a putback by Kae Jon Barnes. But Bangai sealed it with two more free throws for a 56-52 lead. The Cardinals’ desperation shot at the buzzer was short. St. Paul closed the first quarter with an 11-5 surge to lead 15-10. But with Bangai on the bench, the Cardinals prospered, using a 15-4 blitz to lead 25-19. The Swordsmen, with Bangai back in, closed the half with a 6-0 run to lead 26-25 at the break. They pushed the lead to 47-39 after three quarters before the Cardinals opened the final quarter with a 11-4 surge and pulled within 51-50 on a 3-pointer by Bradley with 1:15 remaining. Bangai then went 5 of 6 from the foul line down the stretch to send St. Paul to the finals. PASADENA >> Maranatha High School certainly can’t complain about its return on investment when it comes to boys basketball coach Tim Tucker.Four years ago, Tucker was brought in to make the Minutemen a power and he’s doing just that. For the second time in four years, Maranatha will play for a CIF Southern Section championship after posting a 52-50 win over visiting Cantwell-Sacred Heart of Mary on Friday night in the semifinals of the Division 1AA playoffs.Maranatha improved to 18-9 and will play either Rancho Verde in next week’s championship game. CSHM, which had beaten Maranatha in December, finishes at 15-15. Maranatha had to withstand a furious rally by CSHM in the fourth quarter. The Cardinals fell down by double figures early in the second half, but after chipping away, took a 45-44 lead with 2:50 left to play. It didn’t last long. 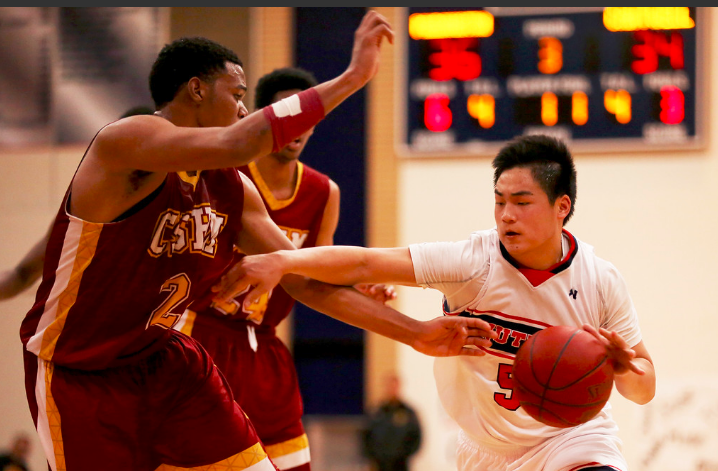 Maranatha’s Josh Kim drove to the basket, got fouled and made the shot. Kim hit the free throw to put his team up two. CSHM tied it at 47-47 moments later, but Maranatha had the answer yet again, this time on a flashy drive and scoop for the score by guard Sean Espinosa with 50 seconds left. Trailing 49-47, CSHM had Maranatha in a precarious situation with 14 seconds left to play. The Minutemen were in-bounding the ball under their own basket with just five seconds left on the shot clock. But on the in-bounds attempt, the referee ruled that a CSHM player kicked the ball and the shot clock was reset. Cantwell was forced to foul and sent Maranatha big man Jesse Elrod to the line, where he nailed both free throws for a 51-47 lead. Maranatha fouled CSHMl guard Dawit Wilson on a 3-point attempt and he made all three free throws to cut it to one. Elrod was then fouled on the in-bound pass and made both free throws with just over one second to play. CSHM’s full-court shot for the tie fell way short as time expired. Natalie Day and Gabrielle Hurtado each scored a goal as the Matadores upset top seed Corona del Mar. La Mirada, seeking a CIF-SS 3-peat after winning Division 4 the past two seasons, advances to Tuesday’s semifinals. The Matadores will host Temecula Valley. IRVINE — The feeling was still fresh. The moment raw. The Adrenaline still pumping.Finally the Schurr High School girls water polo team came together and let out a roar as it celebrated advancing to the program’s first CIF Southern Section final.Schurr reveled in the moment as the high-fives, hugs and smiles gave way to jumping and screaming for joy.“It was like a mosh pit,” Schurr’s Stephany Velasquez said.Schurr scored the final four goals of the match to stun top-seeded Agoura 7-5 in the Division 2 semifinals at the William Wollett Aquatics Center to punch its ticket to the program’s first CIF final.Schurr (30-2) advances to play Riverside Poly in Saturday’s final. Riverside Poly was a 6-5 winner over Riverside’s King. “This group has been working so hard since September,” said Schurr coach David Argumosa, in his fifth season. “We did not play that many matches early, so we were not ranked very high in the beginning of the season, but the whole idea was to gear toward the end of the season. Agoura (22-9) missed a chance to make its first CIF-SS final since 2007. It was heartbreak city for Agoura, which led 5-3 with 5:57 left in the match after a goal from Lexi Rond, who had three goals. Maddie Demattia scored twice. Schurr did it with balance as seven players accounted for the seven goals. Lizbeth Guzman, Milena Guzman and Nayeli Cisneros scored in the first half. 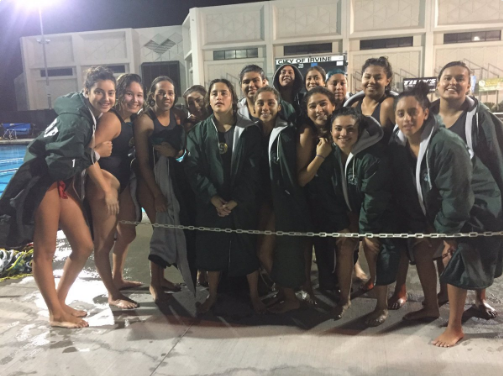 Then Valeria Martinez, Cynthia Rosa, Kayla Santos and Jassmine Kezman rattled off the four consecutive goals in the fourth quarter. Santos delivered the tie-breaking goal with 1:29 left in the match. “I didn’t know what to do. I was scared,” Santos said. “Should I shoot it? Should I not shoot it? So I just shot it and it went in. The dagger came from Kezman with 31 seconds left to put the match on ice to cap the dramatic comeback. Schurr goalkeeper Itzahiana Baca said she liked the way her defense responded when Schurr began making its fourth-quarter comeback. “All of their shooters were really good, but my team just really stepped up, especially in that fourth quarter,” Baca said. Schurr’s comeback foiled a fantastic performance from Agoura goalkeeper Emma Pfister, who made 11 saves, including a pivotal stop of a 5-meter shot midway through the second quarter that seemed to give Agoura momentum, at least for a little while. “It could be all in my head, but I did notice a change in the team after that 5-meter,” Pfister said. “We got our normal Agoura mentality back.